The climate of the Niš area is moderate continental, with an average yearly temperature of 11.2 °C. 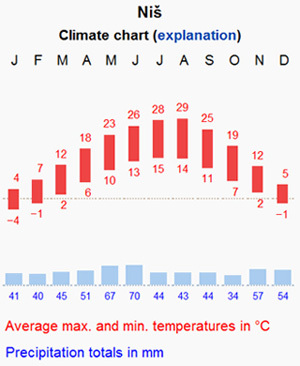 July is the warmest month of the year (with the average of 21.2 °C) and January is the coldest month (with the average of 0.2 °C). The average of the annual rainfall is 567.25 mm, while the average barometer value is 992.74 mb. There are 123 days with rain and 43 days with snow. On the average, the wind force is just below 3 Beaufort. April is a month in spring with variable weather conditions that can result in sunny periods and occasional showers. Temperature will probably vary in the range from 5 to 20 degrees. International outgoing prefix is ‘00’. Incoming prefix is ‘381’ for Serbia and ‘18’ for Niš. When you reach Serbia, three mobile operators will offer their services to you – MTS (www.mts.telekom.rs), Telenor (www.telenor.rs/en/Consumer/) and VIP Mobile (www.vipmobile.rs/home.8.html). Serbian currency is called Serbian Dinar (RSD). All payments in Serbia are done in Dinars, so any foreign currency has to be exchanged in exchange offices or banks that can be found all around the city. There is no provision for money exchange, but beware of the fact that only a limited number of exchange offices and banks have the ability to exchange currencies other than Euro, American Dollar and Swiss Frank. However, in most cases, payment can be done by credit cards. Electricity is 230 V/50 Hz with standard European plugs and sockets. There are many pharmacies in the city that usually close by 9 pm. There is one 24-hour Pharmacy called “Ćele Kula” located in the center of the city, Trg Sindelića 24.